This antique sign points the way to the men’s restroom. The sign is a white rectangle. “Clean Rest Room” the sign reads in blue text. 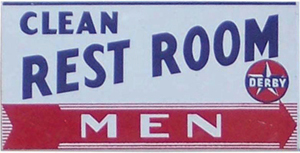 At the bottom of the sign, an arrow pointing to the right has the word “men.” The Derby service station logo appears in the lower right corner.